We bring our enthusiasm and knowledge to every project to deliver a friendly, professional service. 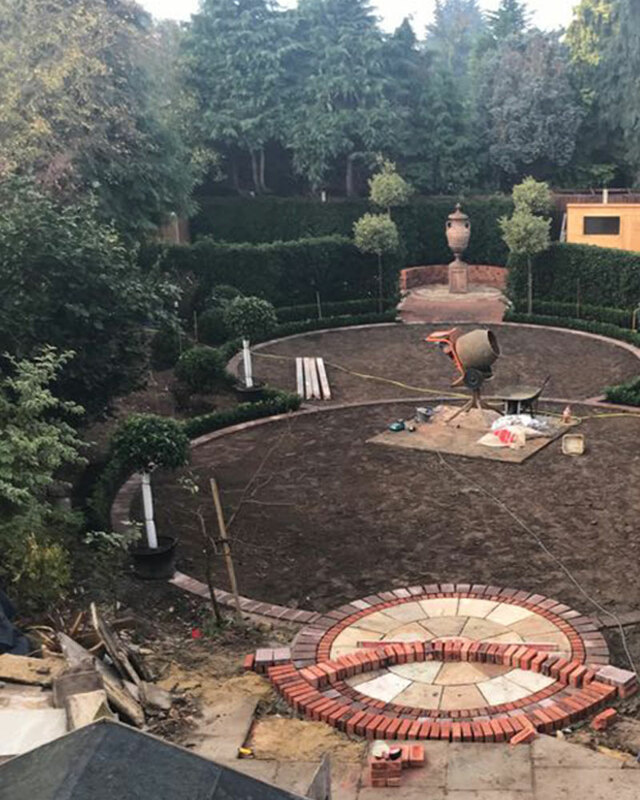 In this section we try to give an idea of how a typical garden design project progresses through various stages of the process. The process begins with an initial consultation (roughly an hour in length) an informal meeting where I visit the site in your company. This is where I get a feel for the project and discuss your aims and desires for the space. Every job is unique and my aim is to assess, with your input, what the project requires. 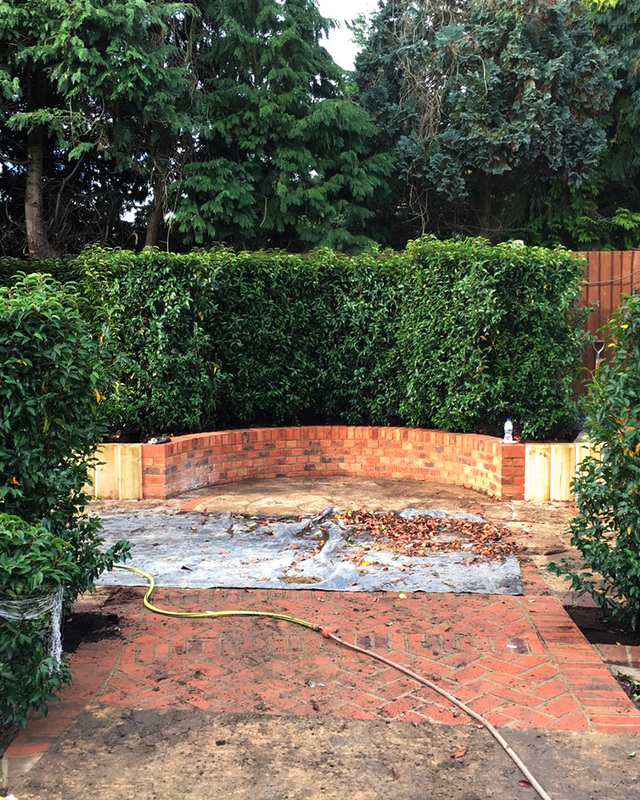 It may entail starting from scratch or a full re-design with hard landscaping but there are times when I find a lighter touch is required – it is, of course, project dependent – I never press prospective clients into needless work and endeavour to do what’s best for the garden. 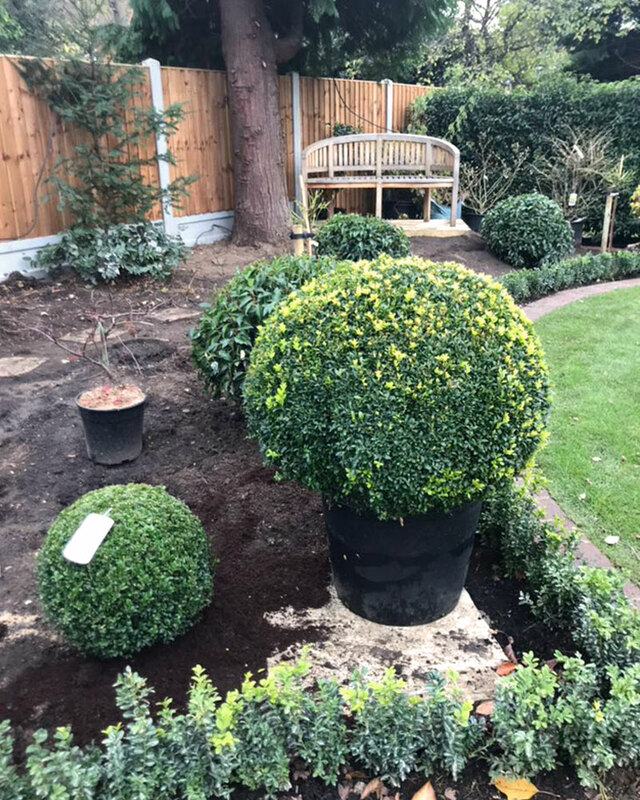 I don’t work to a formula and aim to be as accommodating as possible, sometimes the solution can be a few practical steps and a deft planting scheme, one that is less punishing on your time or budget. After that consultation I’ll come back to you with a client brief. This sets out what is required; the aim being to clarify the nature of the project for both parties’ benefit. I stress that the brief, whilst important, is not set in stone; garden design can be an organic process and a sense of flexibility is required. Once this has been agreed I set to work on generating ideas, designs and schemes. Back in the office I take a few weeks to collate information and digest the agreed project, larger projects may take more time. 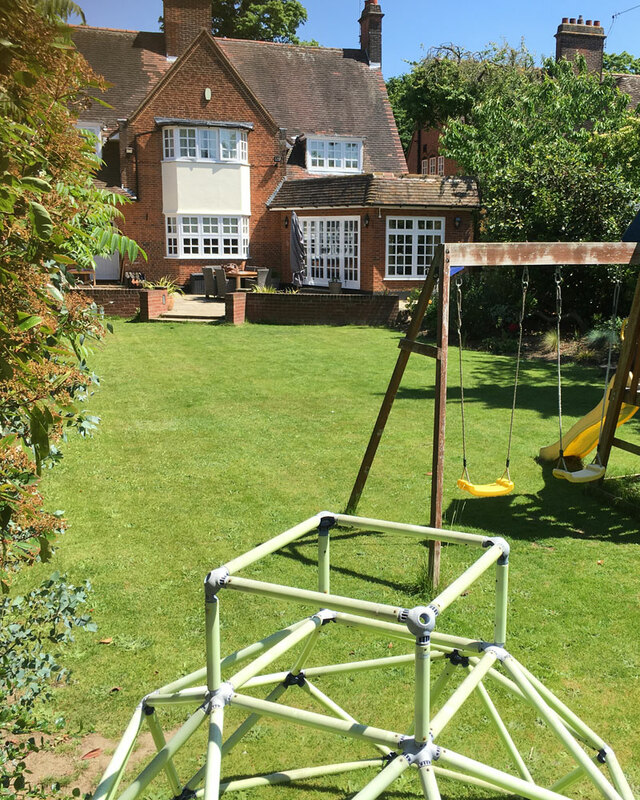 I conduct a more detailed site survey – noting measurements, privacy, soil, drainage and identify any possible pitfalls and constraints – and take these into consideration. In my experience as a garden designer, whilst sketches, scale drawings and elevations are sometimes necessary, a more immersive presentation of plans can often be more effective. In an effort to make the concept come alive, rather than lifeless elevations on the page (which can also be a drain on design time) I like to mark things out in situ – delineating beds and sections on the ground in front of you. I find this gives you a more insightful sense of scale, shape and flow of your new garden. Clients have benefited from stepping into the space or viewing it from an upstairs window to really envision the idea. Once the design plans and budget are agreed I draw up a list of costings, planting schemes and a schedule of work. 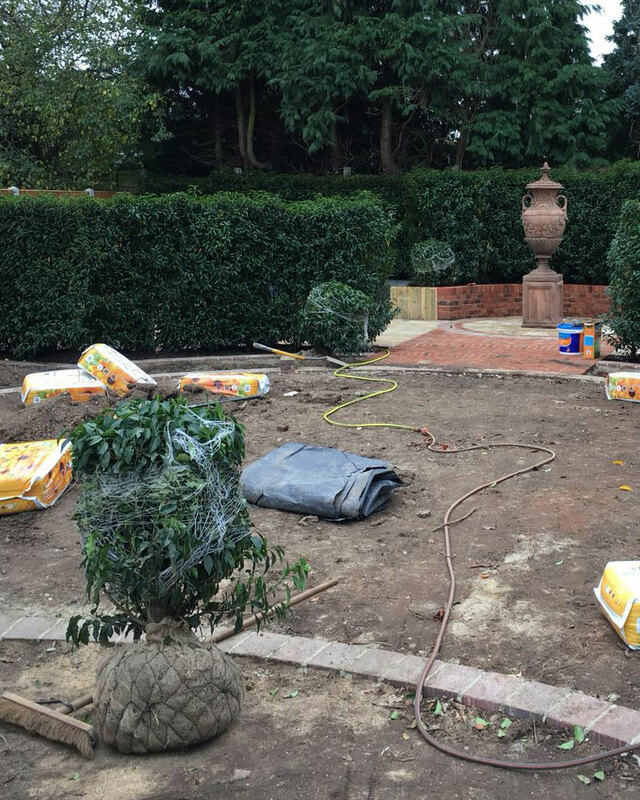 If hard landscaping is required it is sub-contracted to a local company and the project commences. As an experienced project manager I can oversee the work, make site visits to monitor progress and instruct. 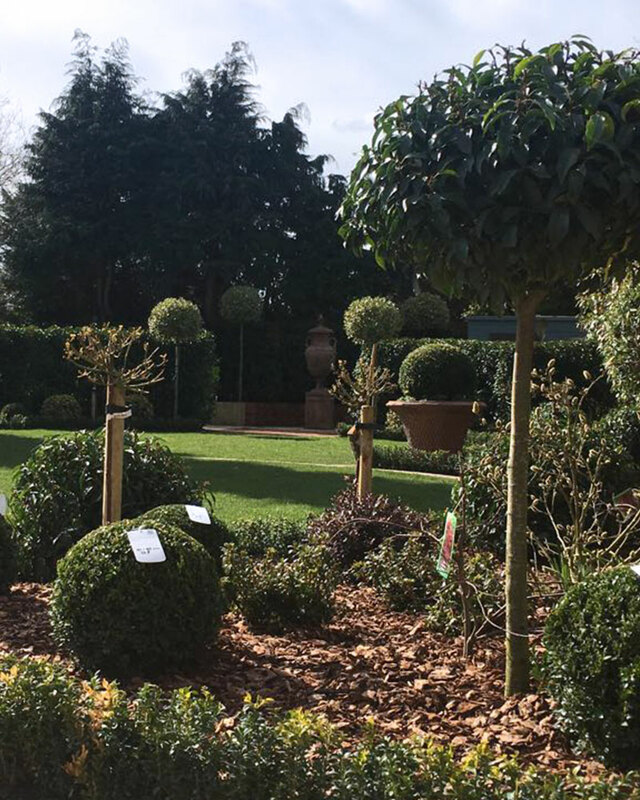 When this stage is complete we progress to the planting: plants are sourced, ordered, delivered and planted. For some projects planting all in one pass is not feasible – it may be dependent on the time of year, the availability of certain plants or how elaborate a scheme is – so arrangements may be made for a phased planting schedule. 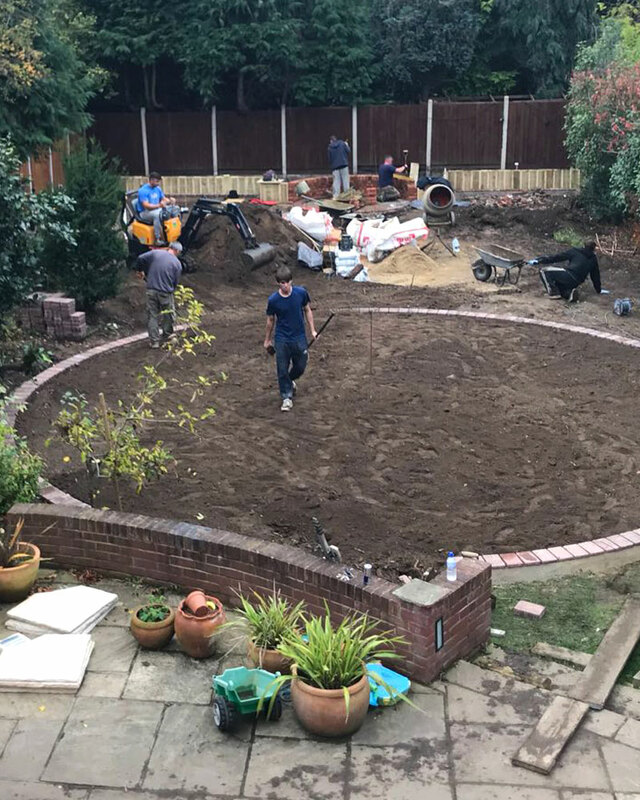 Plant focused garden design is intended to unfold and transform over time so a maintenance schedule can be created to ensure your new garden advances along the correct course. 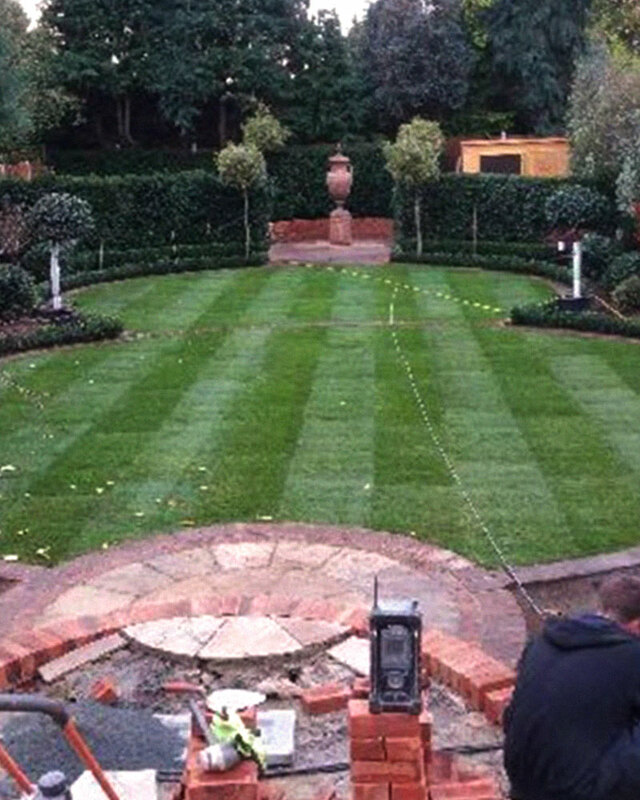 We can provide written instructions and advice as to how it can be maintained over the course of the next 12 months and further which your regular gardener or groundsman can follow. Site visit where I get a feel for the project and hear the client's wishes. From this designs and schemes are drawn up. With the client happy with the design work commences. Marking out spaces in situ. 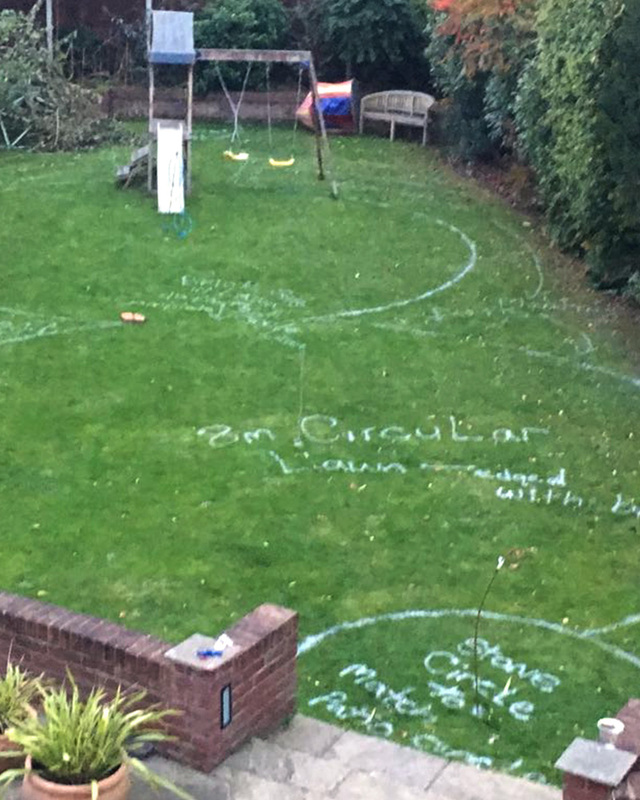 The team begin to create the circular lawn. 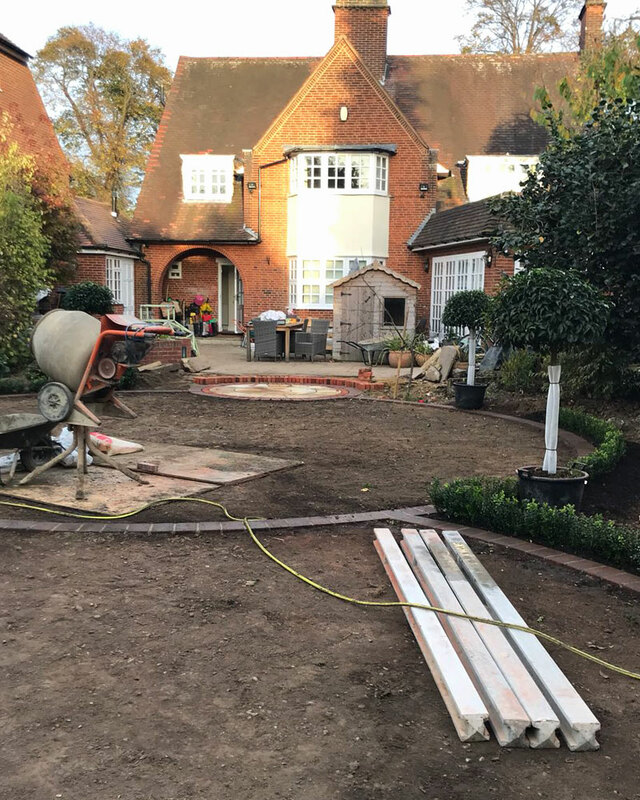 Paving design is laid and plants and hedging go in. Detail of geometric paving design being laid. 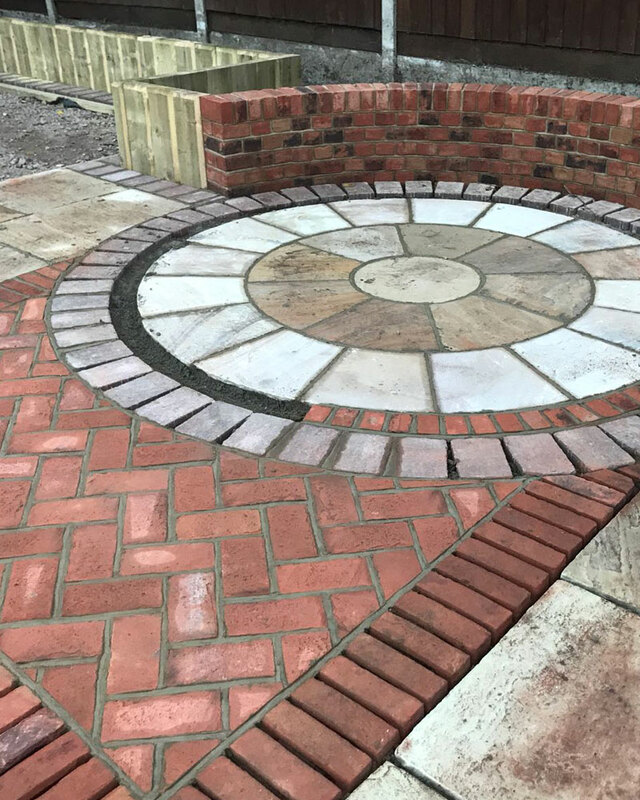 Geometric paving design is laid and hedging in place. 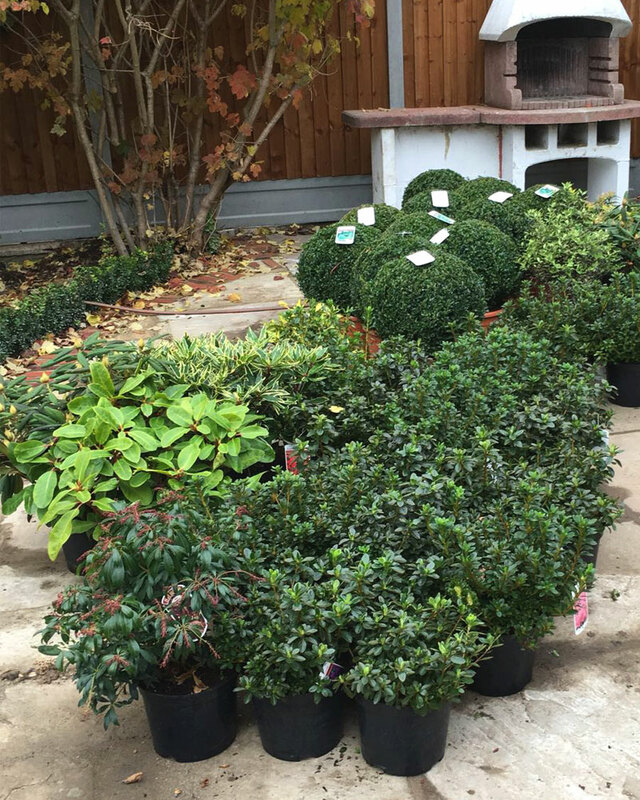 Plants bought, delivered and ready for use. Plants are positioned in situ ready for planting. 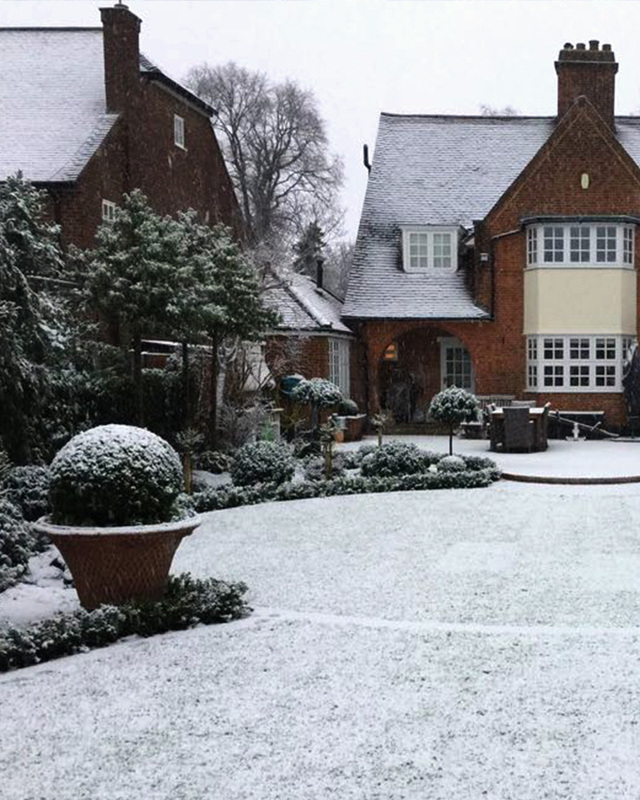 Garden looks great in all seasons. 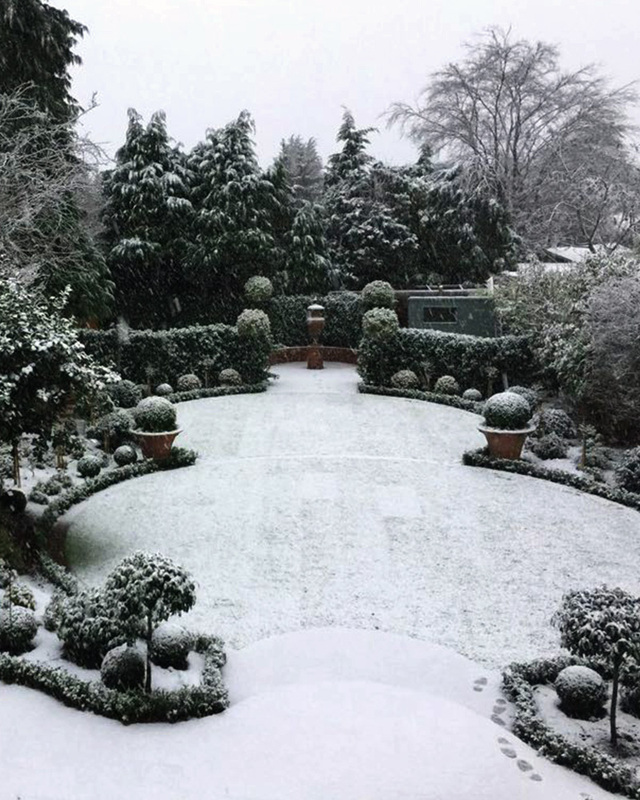 Snow shows off the structure of the planting beautifully.